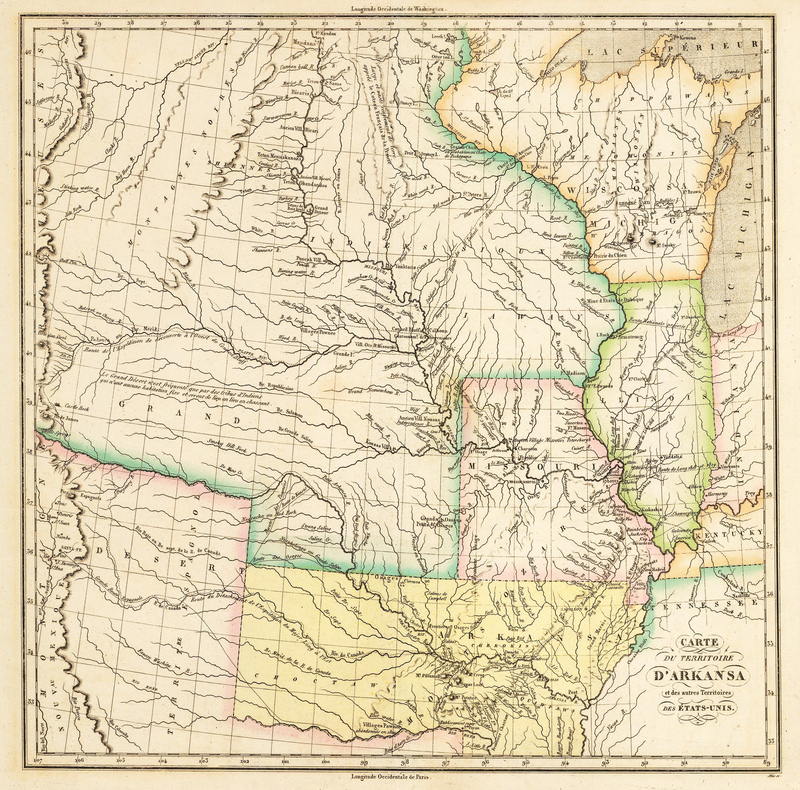 Home > U.S. South > 1825 Carte du Territoire D’Arkansa. 1825 Carte du Territoire D’Arkansa. This copper plate engraving is a French edition of Stephen Long’s seminal map of the region drained by the Arkansas, Kansas, Missouri and Mississippi Rivers, one of the most important maps of the American West. This map appeared in Jean Buchon’s French edition of Carey & Lea’s ‘American Atlas’. Stephen H. Long led a Government expedition to the Rocky Mountains in 1819 and 1820. Though it came after the Lewis & Clark expedition, it is generally regarded as one of the most important early overland expeditions in the USA, and this map illustrates the official account of Long’s expedition. The map shows Arkansas Territory extending to include present-day Oklahoma. Long’s map extends to the Rocky Mountains, with the plains labeled Grand Desert and further it is noted that nomadic Indians are known to roam in this area. A remarkable number of Indian villages labeled as ‘Ancient Villages’ are shown, with the names of tribes and their precise locations. As would be expected, the majority of these villages are situated on the banks of rivers throughout the region. A number of routes taken by other exploratory expeditions are also depicted. The map shows the Arkansas Territory extending to include present-day Oklahoma. The Long Expedition was the first scientific survey of the region and dramatically increased the country’s geographical knowledge of the West. Condition: This map is in A condition. Side panels of French text have been removed.